(Hard-cover) If you want to collect something really special, go for these. I do. 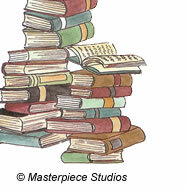 I have all of Jane Austen and am working on Charles Dickens, Thomas Hardy and the Brontes. Complete and unabridged, plus they look very rich together on one shelf. Please buy some of these yourself so I can buy some of these myself. Thanks. (Hard-cover) These books are absolutely beautiful, and with original illustrations and original translations, they are beautiful on the inside too. I am so pleased to offer these well-done unabridged hardcover classics that are found on the Accelerated Reader List for your children's use at school and at home. Oh, don't forget to pick them up and read them yourself; they are timeless. This entire set is on my own wish list. (Hard-cover) Compact and yet lengthy, these pocket-size books are loaded with all of the well-known poetry that we grew up on and more. Enjoy your journey.